The Marvellous Micro Ring Hair Extensions! Micro ring hair extensions also known as micro loop hair extensions, beaded hair extensions, micro link hair extensions and micro bead hair extensions are proffered as one of the safest methods of hair extensions as they don’t use glue, moulded bonds or heat to apply or remove. Here are some quick fire points about how this nifty little hair extension works! Well the name says it all, they are hair extensions (called I-tip or stick tip hair extensions) that are attached to hair by little ring. The rings come in five sizes with the medium size usually being used on average density of hair. The smaller rings can be used near the edge of the hairline. It's quite common for people to have them applied ear to ear around the back of head in order to add length and fullness. How Are Micro Ring Extensions Attached? 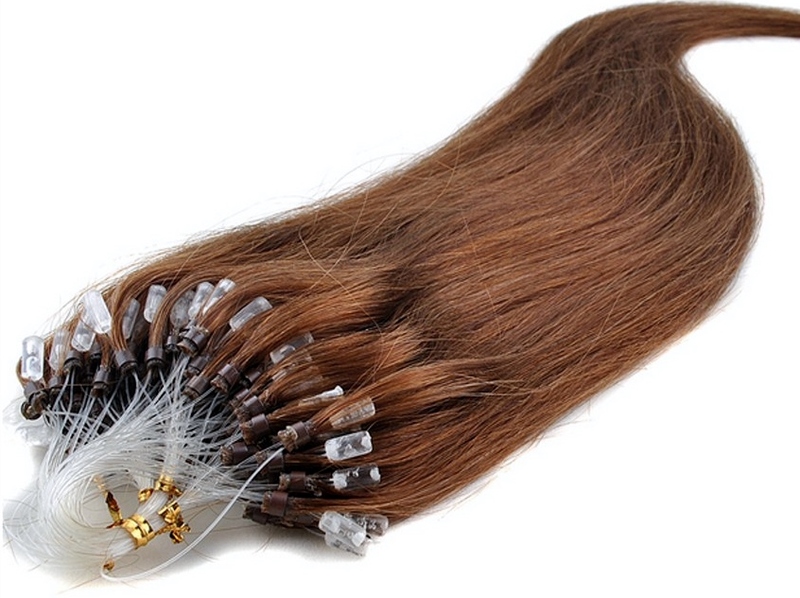 The hairdresser takes a few strands of growth hair (think of the thickness of few millimetres) and attaches the stick tip (I-tip) micro ring hair extensions by drawing the growth hair through the ring using a micro ring needle or latch hook. The ring is then tightly clamped to shut the hole using micro ring pliers securing the hair extensions to the growth hair. Micro loop hair extensions come with pre-fitted plastic loops which are used to thread the growth hair through the micro rings instead of using a pulling needle. This is an easier application of micro ring extensions and both types of micro ring extensions are available in a variety of textures. As of 2015 there isn't an officially accredited course that you can complete to learn the process of attaching micro ring extensions, but there are plenty of courses available (both attended learning and distance learning) that will teach you the various methods of attachment and about the different types of rings. 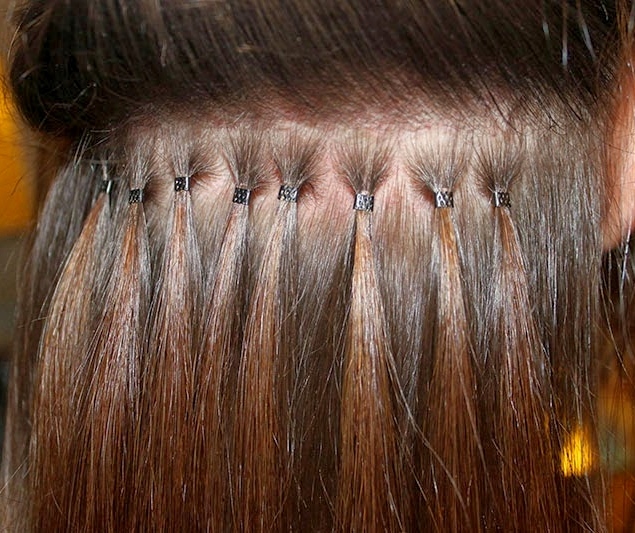 How Are Micro Rings Extensions Removed? Easy, the same micro ring pliers that clamped the ring shut is used to pop it open and the hair extension is extracted. Because of this method, some people use the same hair for two applications. The downside is that they do have to be removed with professional equipment. The use of nail clippers for removal can potentially cut the growth hair… and this site is all about additional length! What Are The Actual Micro Rings Made Of? In the olden days… 1992 … They were made of metal which as you can imagine caused a whole host of problems when the hair was washed… Fancy some rust with your conditioner?! Nowadays they are made with sophisticated mixes of plastic which mean they don’t corrode or break down if you wash your hair or go swimming in a chlorine pool. There are a number of things that micro ring extension wearers should do to look after and maintain their micro ring extensions. The fact is, your daily styling routine will last a little longer due to ensuring that the hair extensions are detangled (preferably with a detangling comb specifically for hair extensions) and heat styling your micro link hair extensions should be kept to a minimum. You'll have to make sure that the way you wash your micro ring extensions, along with the way you dry them doesn't damage them. You'll also have to make sure that you don't style or comb your micro ring extensions in any way that puts a strain (or tension) on the links (you don't want to weaken the bonds or cause the micro rings to slip down your natural hair and come out) and the combing techniques apply to straight micro link hair extension textures as well as wavy micro link hair extensions and curly texture micro ring hair extensions. You can still participate in sports and exercise, and although you can go swimming with micro ring extensions, it's important to remember that chlorine can cause the hair to dry out and can sometimes change the colour of the hair too. If you're new to micro link hair extensions or want to refresh yourself on how to care for them then click here to learn about who can wear them and basic maintenance. There's more information in the Hair Extensions Q&A section, or if you'd like to keep up to date with the next guide about hair weave, hair extensions, wigs and hairpieces then join our blog.